Do you recognize the song? "My Favorite Things" And that's what I'm going to talk about today. We lived in a good sized house in Nebraska. And I L*O*V*E Christmas! And just think how many really, really cute Christmas decorations there are!! Multiply that by 44 (adult) years! And I didn't buy them all! 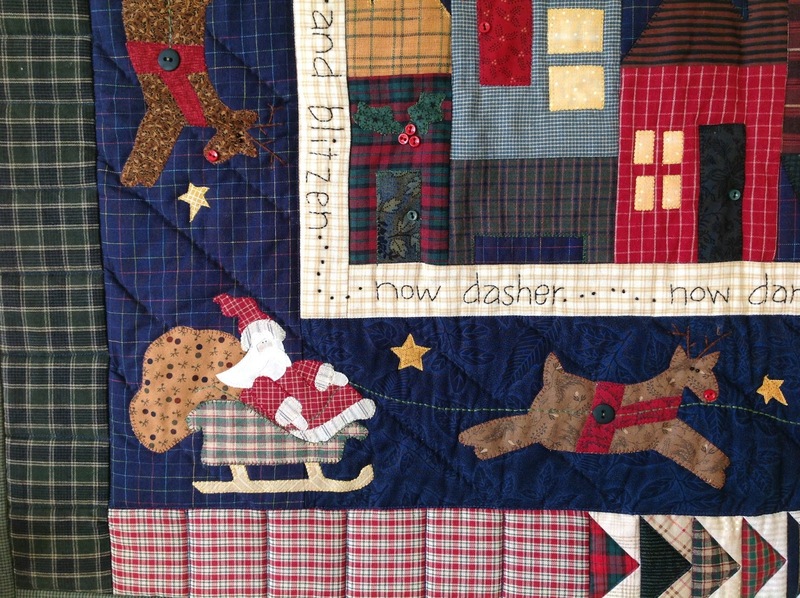 - And quilters can figure out patterns and methods. Alot I just re-created! AND then came the greatest enabler of them all - Pinterest!! I'm just saying - opportunities exploded! 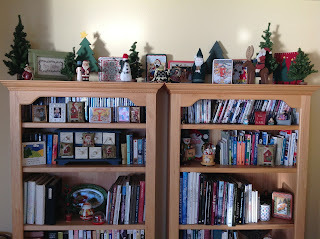 Of course, when we moved we downsized, downsized and downsized - I gave alot of Christmas goodies to family and friends. Sold even more at the garage sale. Even dropped alot off at the thrift store. But there are favorites you just have to keep! 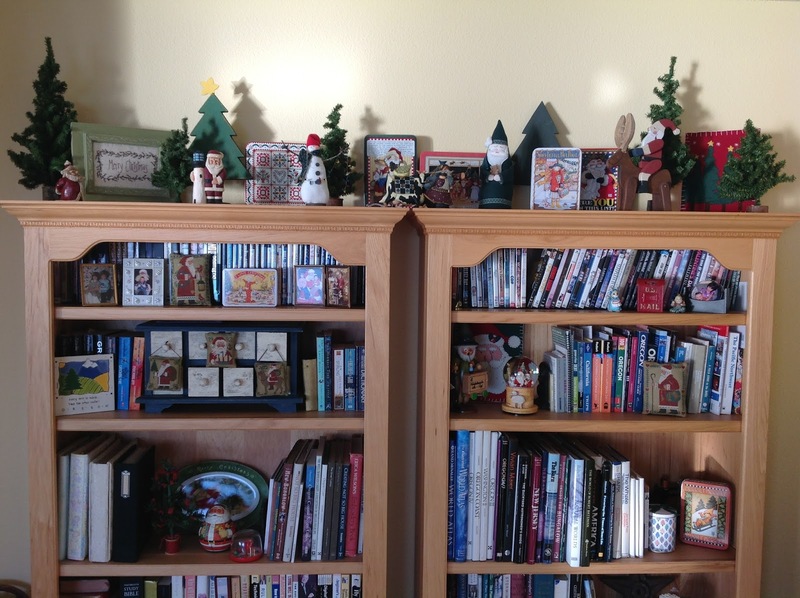 Our little condo is just chock-full of Christmas! Here are a few of my favorite things! Our Nativity Scene - I bought this right after we were married from a church supply store I worked by. I loved it. I thought it was the loveliest one I'd ever seen - and 44 years later, I still think so! 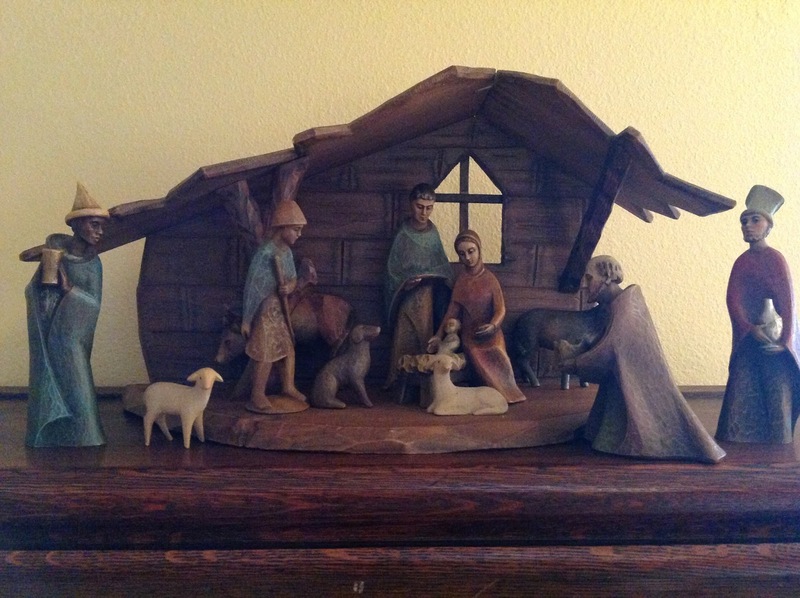 It used to sit under the tree, now it's on top of the Barrister's Bookcase full of quilts. I asked DH which of the decorations was his favorite - and this wall quilt was it! I made this from an Heart to Art pattern in one of their many Christmas Books. When I was working on it, DH looked at the cut out shapes and wondered why I was making 8 tiny schnauzers pull Santa's sleigh. They do have the same body type! And yes, that is hand embroidery around the center! It's made to be a table runner, but I (we) like it on the wall, where you can see all the details. 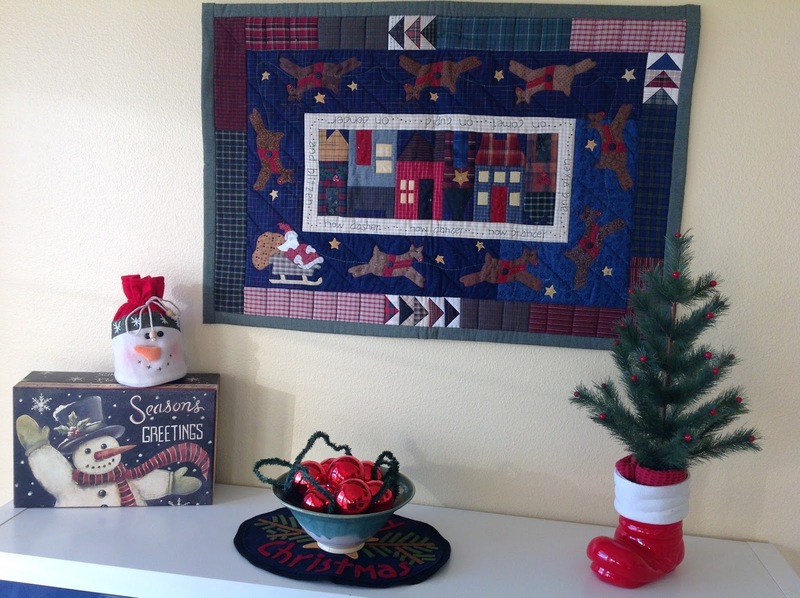 That is one of the 'tips' of living in a small condo - take down the pictures and hang your seasonal wall quilts in their place. I love Heart to Art patterns. Cute but not too 'cute-sie'! 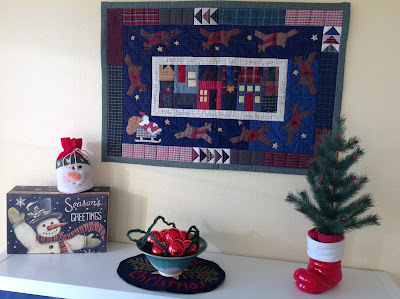 I love this wall quilt - found it on Pinterest! I made the center for my favorite Christmas Elf. A good quilting friend that was our Christmas party chair for years. I liked it so much - had to make 'one for me'!! But it was too small for the space I wanted it in. I just happened to have a bazillion tiny log cabins, so I sacrificed 20-some of them to bring it up to size. 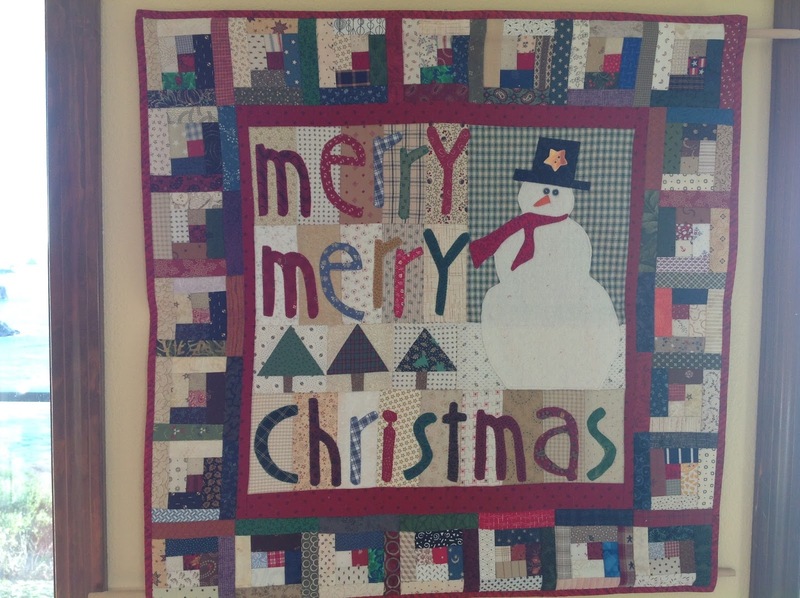 The most unusual thing about this little lovely - I finished it the same year I made my friend's! Ok, lets be honest - how many 'one for me' projects languish at your house?? Yea, me too. Mom loved to write things out with Alphabet blocks. I collected them too and wrote "Merry Christmas" and "Happy New Year". DH said, "Where's my sentiment?" And what would that be?? "Bah, Humbug! of course!!" 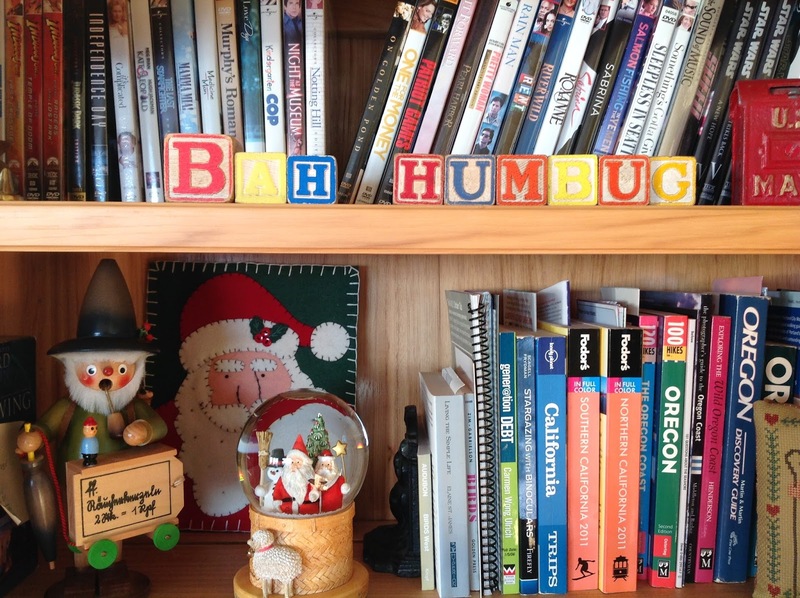 So now every year both our sentiments are on the shelf!! I miss Prairie Schooler. They retired last year? And I collected their yearly Santa for decades. 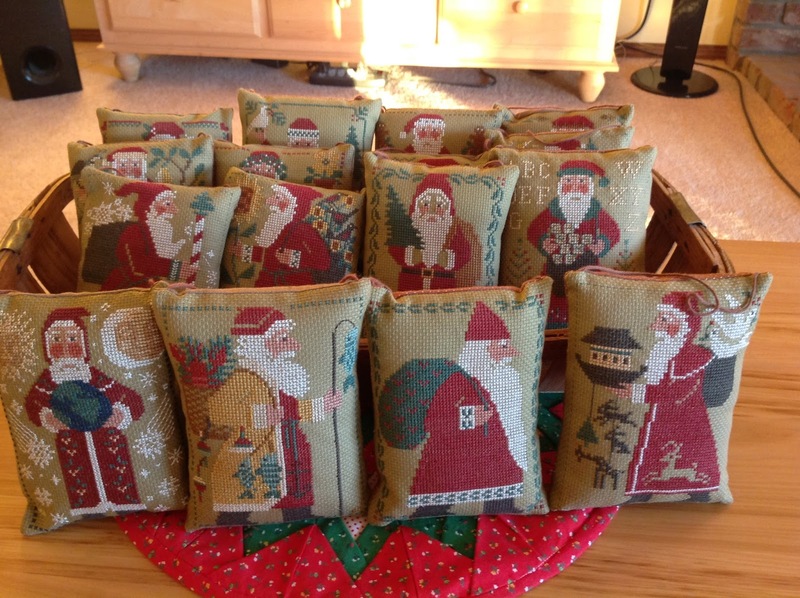 In the beginning, I made each Santa religiously! Then we hit a design I didn't really care for - and you know you had to make them in order!! So I developed quite the backlog. One year I pillowed at least 7 of the them!! And the downfall was it was easier to do them by batches! At least you remembered how you did it!! 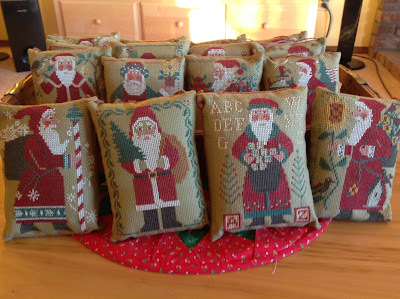 The second Santa from the left was supposed to be growing Pointsettias, but sunflowers were popular on the prairie - so I [gasp!] changed it! And although they have oh-so-much-detail they do not have any nasty half or quarter stitches! YAY! I love their eyes and rosy cheeks. 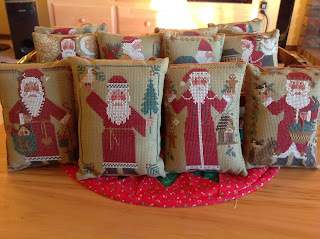 I'm sorry to say, I have another backlog of stitched Santas to pillow. And they are the cutest ones! 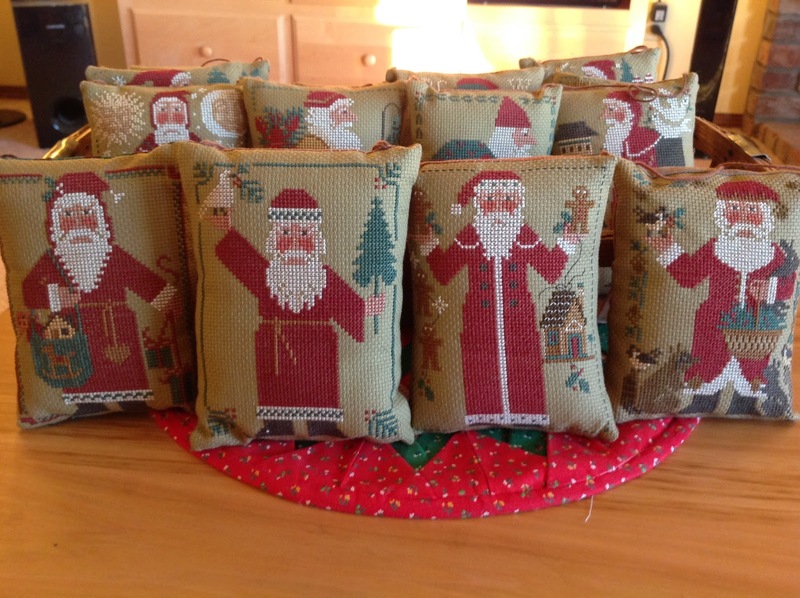 Sewing Santas! Sigh. But now that the design series is complete, maybe I can talk myself into getting busy! LOL! The rest of the year they are at the bottom of the To Do list and December is way too busy to do them!!! But, if I can find them ... this could be the year! My good friend C has her name on these! Otherwise, we both fear they will end up at a thrift shop!!! A quilting teacher once said, don't give your best quilts to your children. They will sell them for a lift ticket!! They grew up with them, they usually don't cherish them appropriately!! There's a little truth in that, even with the best children!! STOP THE PRESSES! Look at this great idea for hanging stockings!! I have two of the low, heavy brass hanging 'platforms' with an adjustable curtain rod between them! You slide the stockings onto it, space them out evenly and you have space on the mantle for things other than stocking hangers!! What a concept - add stockings at will! 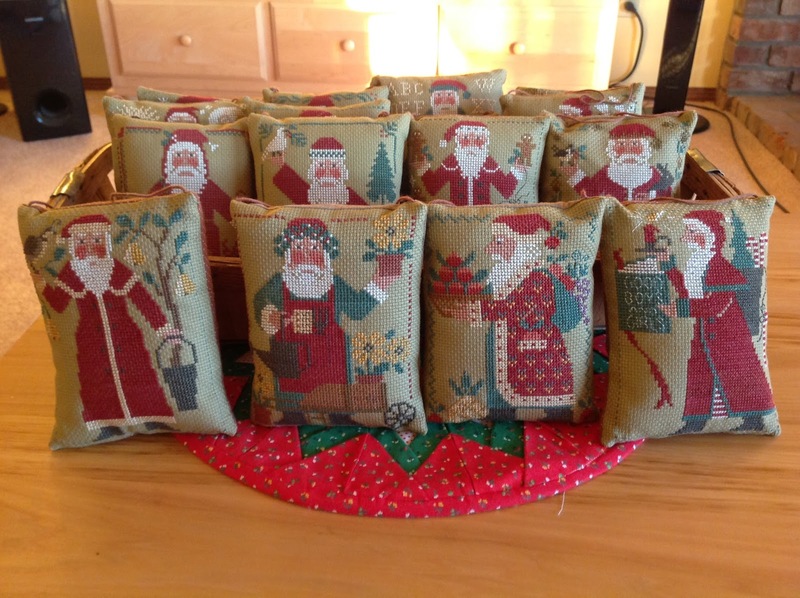 Much easier than finding or collecting (or dusting) stocking hangers for all the stockings! Thank you, Pinterest!! We needed stockings the same size as I made for the kids. 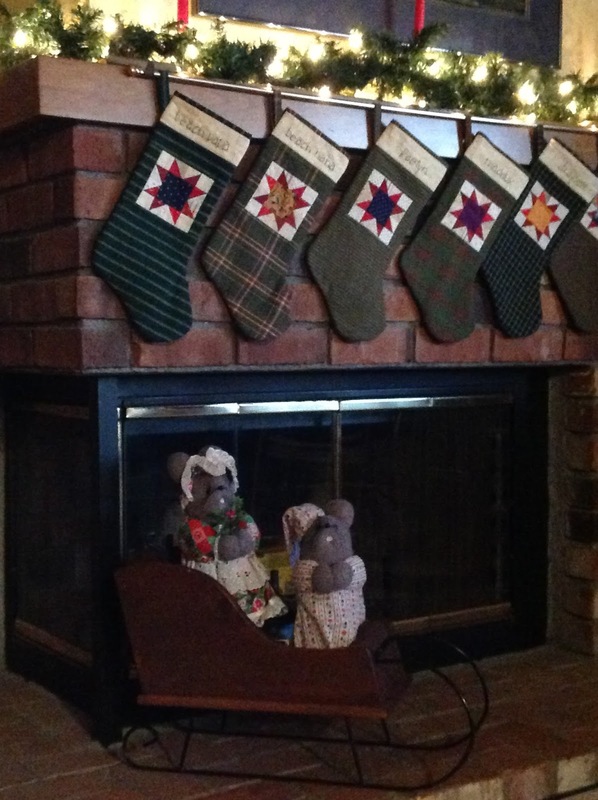 We couldn't expect any stocking stuffers if we didn't have clearly marked Christmas stockings. So I made "Beach Nana" and "Beach Papa" and one for each grandkid to hang at our house. We pack 'Nana and Papa" every year and take them with us on the Christmas trips. And although we really don't behave that well, there is always something in them!! Yay!